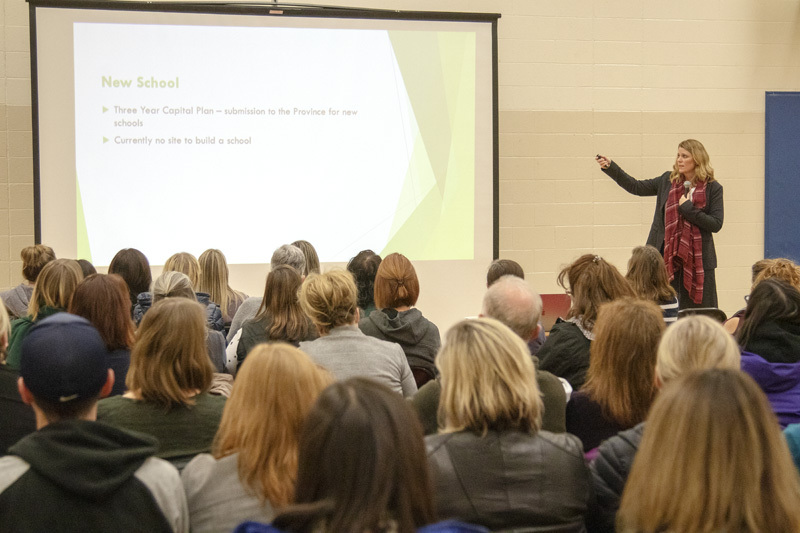 Rocky View Schools (RVS) held a public meeting Nov. 27 to update parents on the space shortage faced by the school division. 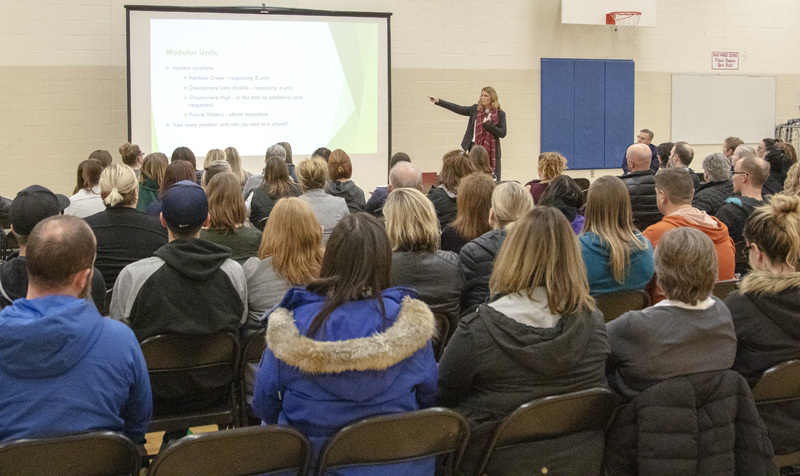 About 120 people attended the information session held at Chestermere High School. Currently the school board is at about 85 per cent capacity, which according to RVS is the ideal enrollment level. However, with continued growth, and the current infrastructure, the school division projects it will be at 100 per cent capacity by 2021. “We need to make some changes to how we’re going to be accommodating students and where they’re going to be attending,” said RVS Board of Trustees Chair Todd Brand. Chestermere’s schools are packed a little tighter than average coming in at 91 per cent capacity. East Lake School is considered to be full with 94 per cent utilization. As an information meeting, the school board did not yet have any specific options they are looking at should RVS not be approved for any new schools by the province. While no specific solutions were presented, Brand felt it was an effective meeting. “We were able to get the information we needed to and really good questions from the people who attended here,” he said. He said that whenever the public is consulted, he hopes to get fresh ideas and perspectives that the board may not have considered yet. “I think as trustees all of us will have pulled out some things that we need to do a little bit of research on and add some options into the next meeting,” said Brand. Looking to the future, the next meeting which will be scheduled in the new year will be when the board lays out the researched options to solve the capacity crunch. In broad terms, the divisions laid out its options as either add capacity or reduce enrollment. As a school board, RVS does not have a lot of control over adding capacity either through the building of new schools or adding modular units to existing ones. The approval and funding for both new schools and modular units comes under the authority of Alberta Education. “We’re somewhat limited as trustees…we can convey the need but we don’t approve the sites, we don’t service the sites and we don’t approve the builds,” said Brand. He said that the board has a critical role in making sure that the province is aware of RVS’ needs and the priority of those needs but the actual decisions are out of their hands. Where the school board has direct control is over enrollment at their schools. “We are the ones that make the decision as to where students will attend, where the boundaries are going to be what the grade configuration is going to be,” said Brand. Potential options the board will review include changing enrollment boundaries or moving programs of choice to different schools in the division. In Chestermere, East Lake School is of particular concern. As a P3 or public private partnership school, the private investor group that handles the maintenance of the school has control over all decisions affecting maintenance. As such, no additional modular units are allowed on the East Lake School site. While the limitations imposed through the P3 model can be frustrating, Brand said that through the P3 program the government was able to build a lot of schools in the province. “And that to me is a good thing,” he said. As Brand and the rest of the RVS board and staff work to review their options, he encourages people to write to all levels of government with their concerns and ideas. “We’re encouraging them to write to the provincial government or the city council, we’re also encouraging them to write to us,” said Brand. The school board is always open to new and creative solutions as well as input from parents. He also said that it is important for municipal governments to hear the public support for build ready sites in new developments for schools and for the province to hear parent’s concerns about capacity and the need for schools in RVS. “As all those different bodies of elected officials, it is very difficult to make good decisions without that input coming from people,” said Brand.